The new Therman Statom mural celebrating Garfield at the Pittsburgh Glass Center. Garfield just got more colorful with the addition of a cheery new mural that takes up the entire wall facing the Pittsburgh Glass Center on Penn Avenue. Unlike other murals in town, this one, created and painted by Therman Statom, a glass artist, painter and sculptor based in Seattle, was designed to represent the vibrancy of the community without relaying a story. 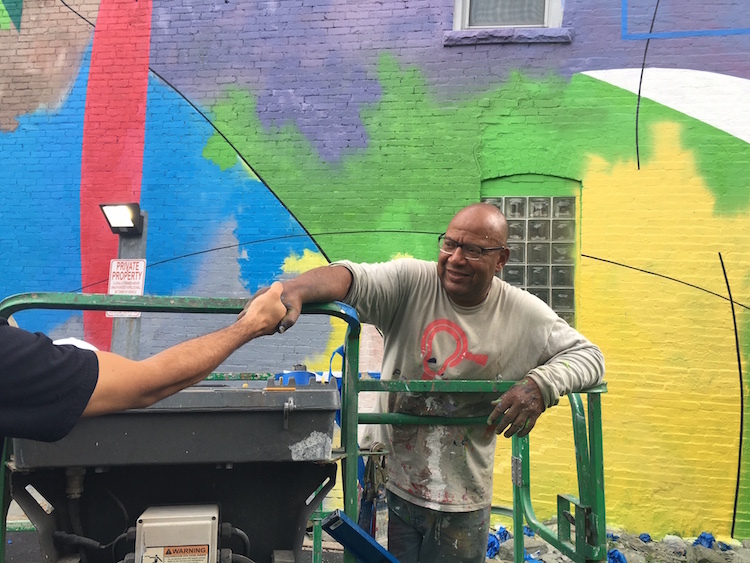 “I wanted it to be cheerful,” said the artist, who painted the mural over several days in August. 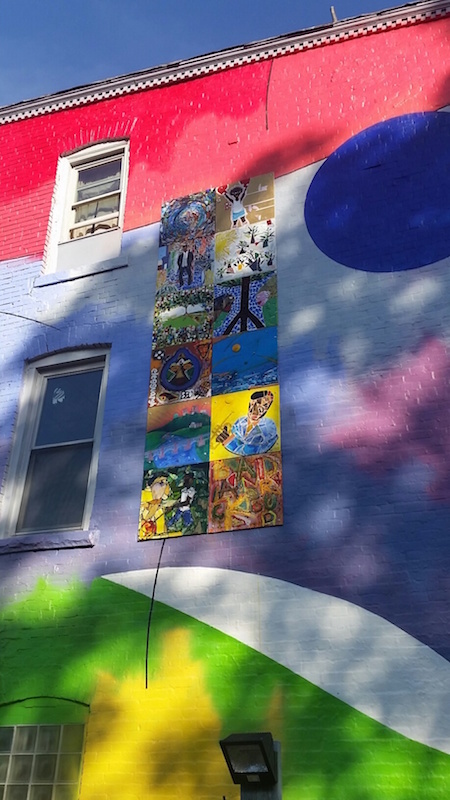 It was completed last week with the addition of 11 panels, each done by a local artist. Eleven local artists contributed panels for the new mural by Therman Statom. It’s all about community, said Statom, an affable and talkative artist who said he greatly enjoyed the time he spent in Garfield as he worked on the conception of the mural. 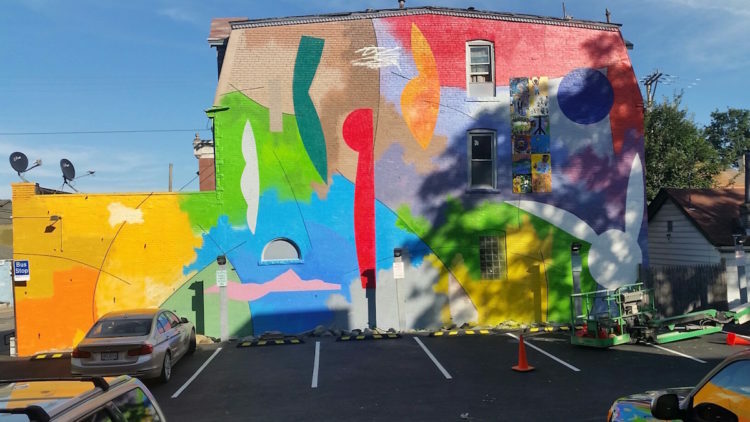 He was commissioned by the Pittsburgh Glass Center (PGC) to create the mural to build community and social interaction, help break down socio-economic barriers, and increase vitality at PGC and along Penn Avenue, says Paige Ilkhanipour of PGC. Statom was already familiar with—and fond of—the neighborhood from previous visits and exhibits at PGC. This time, he talked to 100 residents, including children, to capture the spirit of the neighborhood, and he worked with community leaders as well as Brothers and Sisters Emerging (B.A.S.E.) and S Group Consulting. He also held a free glass workshop at PGC for 50 neighborhood kids. The 11 Pittsburgh artists who contributed panels for the mural are: Bill Satterwhile, Charlotte Ka, Errol “Mobutu” Reynolds, D.S. Kinsel, Boris Balsindes Urquiola, E. Ali Reynolds, Kai Devenitch, Takara Canty, Christine Bethea, Darnell Chambers and Naomi Chambers. 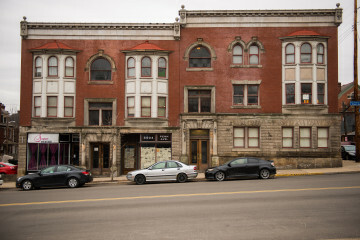 Indagare, Therman’s exhibition at PGC, and his mural were supported by The Benter Foundation, Laurel Foundation, and Advancing Black Arts in Pittsburgh, a partnership of The Pittsburgh Foundation and The Heinz Endowments. Statom, considered a pioneer of the contemporary glass movement, is best known for his life-size glass ladders, chairs, tables, and small-scale houses created through the technique of gluing glass plate together. The artist pausing to talk to a glass artist visiting from Denver. Photo by TH Carlisle. 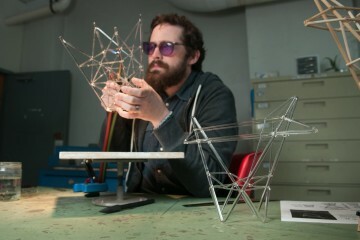 To learn more about Statom, catch the television episode of “Craft in America: Teachers” featuring him on September 15.